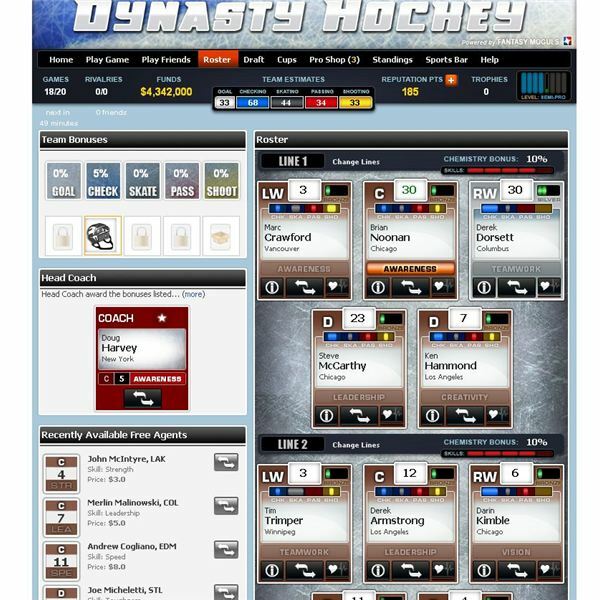 When you start playing Dynasty Hockey, you’ll start with a basic team of NHL players. Through drafts and winning players after games, you can grow your team into the best around. Take your players and match up against other Facebook players. Once you get good, you can play against actual NHL team rosters and battle for cups. Play against your Facebook friends too. In the roster section, you move players from line to line to get the best set of players you can. Every player has a rating at the top of the card. Higher rated players are naturally better so you’ll want these on your first and second lines since they will see more ice time during a game. Players have skills in checking, skating, passing, and shooting, while goalies have skills in goal. You’ll want players that are rated as high as possible in these skills to fill out your roster but you’ll also pay top dollar to acquire them so you need to plan your team accordingly since it will be difficult to have all-star players without a huge amount of cash on hand. When you place a new player on your roster, you’ll need to release an older player. Recent free agents to the left of the roster screen can be hired if you have the money available. As you level up in the game, you’ll get to make a draft pick for each level. You can move up in the draft by using reputation points, which are earned as you play games. Moving up in the draft is ideal if a player you want is available in the draft. You won’t see the same players for each draft and the player you want probably won’t be around again. Once the draft is over you’ll need to release one player to fit the new member onto your squad. You also have the option of skipping the draft and waiting for the next one. Setting up a game in Dynasty Hockey is simple. Go to the play game tab and pick a Facebook player for a match. It’s a good idea to find players at your level or below since, a player higher than you will defeat you easily. It would be nice if the game section had some randomness to it. Once you select a player, you’ll go to experts screen. Here you can see from experts if you will win the match. If there’s no way of winning, you can always scroll back and pick another team to play. With your reputation points you earn from winning matches you can visit the pro shop and buy various bonuses for your team such as enhanced shooting or passing. These bonuses do expire after a certain number of days so you’ll want to buy more. If you are low on reputation points buy some with Facebook credits or just play more games. In the standings section you can view where you are in comparison to other players in the game and get an option to play them if you want. Using the standing is a good way to find match ups that are near your skill level or if you just want to challenge yourself and see how your team does against better players in the game. Visit the sports bar to take part in forum chat about the game or hockey in general. 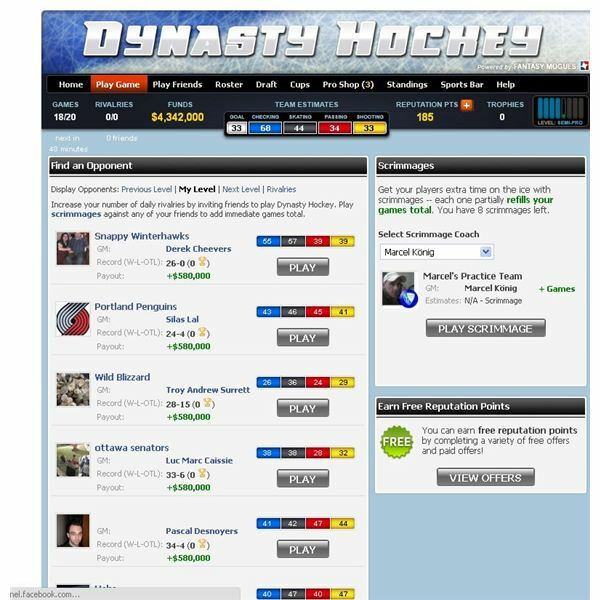 Dynasty Hockey is a great Facebook hockey game and fun to play. Be sure to ask the experts before each match and save your cash for better players. Use the draft to get top-level players and have fun with the challenging cup games too. The forums can offer you help if you are stuck with the game. 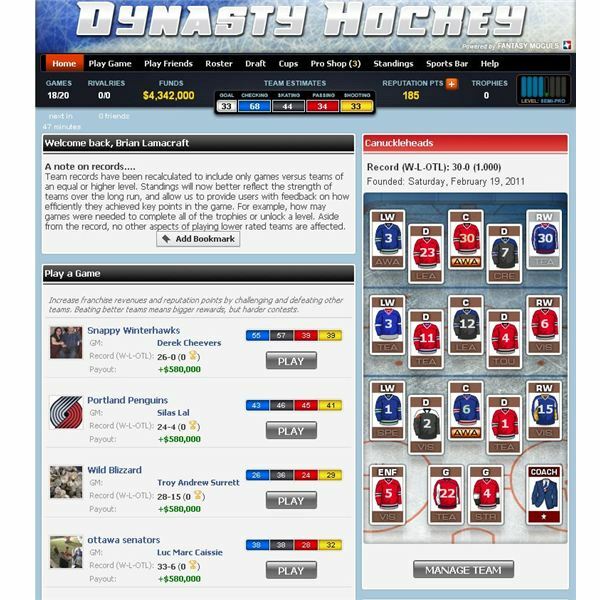 All images from Dynasty Hockey.